View More In Nativity - Page 2. 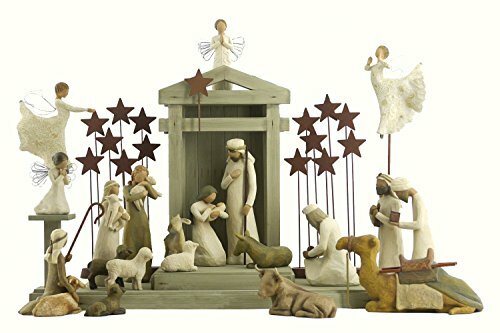 Included are the following items: 26106 Creche, 26005 Nativity, 26105 Shepherd and Stable Animals, 26027 Three Wisemen, (2) 26007 Metal Star Backdrop, 26012 Angel of Prayer, 26107 Angel Stand, 26180 Ox and Goat, 26170 Angel A Tree, 26104 Peace On Earth, Song of Dance Angel, and Song of Joy Angel. If you have any questions about this product by Willow Tree, contact us by completing and submitting the form below. If you are looking for a specif part number, please include it with your message.